Salt therapy rooms are a natural way to relax, rejuvenate and possibly get relief from medical ailments such as allergies, colds, sinus problems and more. 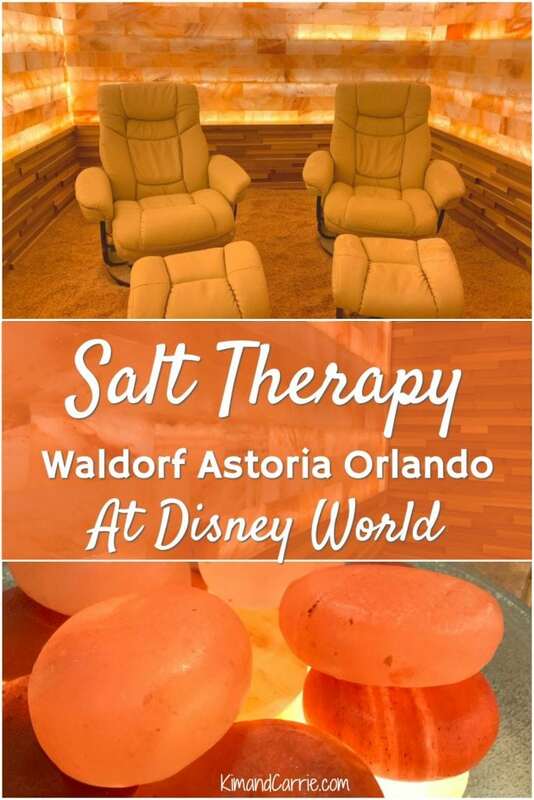 The newest Orlando salt room can be found at Waldorf Astoria Orlando at Walt Disney World Resort. When the Waldorf Astoria Orlando asked me to come experience their brand new Himalayan Salt Room, I couldn’t say yes fast enough. At the time, I was 4 weeks into a horrible cold (or maybe it was allergies) that just wouldn’t go away. It was the lingering cough and chest congestion that just about everyone seemed to have in early winter this year. After repeated visits to the doctor, the chest congestion just wouldn’t go away. I knew about salt rooms, also called halotherapy, as a natural aid for relief from colds, sinusitis, allergies, asthma, bronchitis and more. It’s a practice that has existed for centuries, starting back in Eastern Europe. Salt rooms work because they are filled with tiny particles of salt. 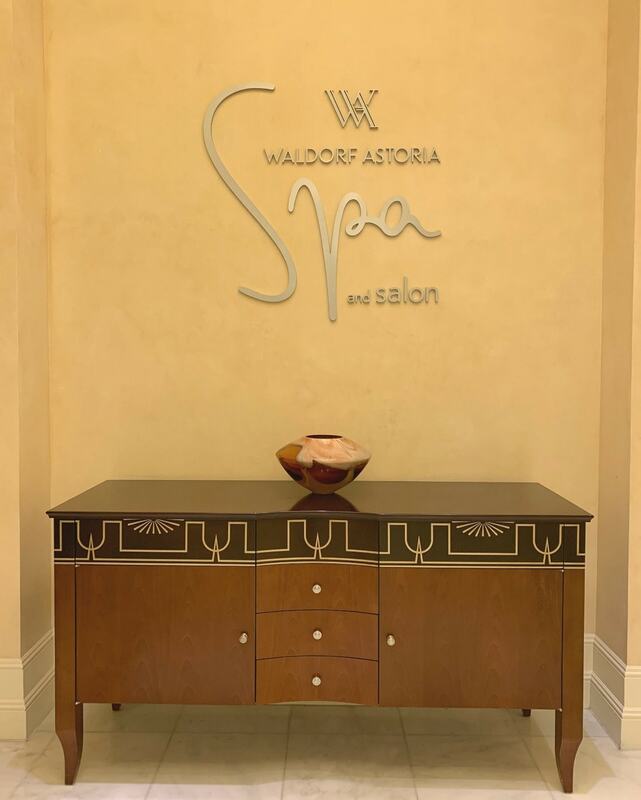 Once inhaled, this natural therapeutic grade salt (it is pharmaceutical grade sodium fluoride at the Waldorf Astoria Orlando salt room) works like an expectorant. Not only does it help your lungs get mucus out, but Himalayan salt is thought to eliminate bacteria and soothe the lungs. You might already be familiar with the soothing effect of salt on your lungs and sinuses. Have you ever used a saline spray for allergies or colds? Or have you gone to the beach and noticed your sinuses cleared up and you could breathe easier again? That’s the power of salt. 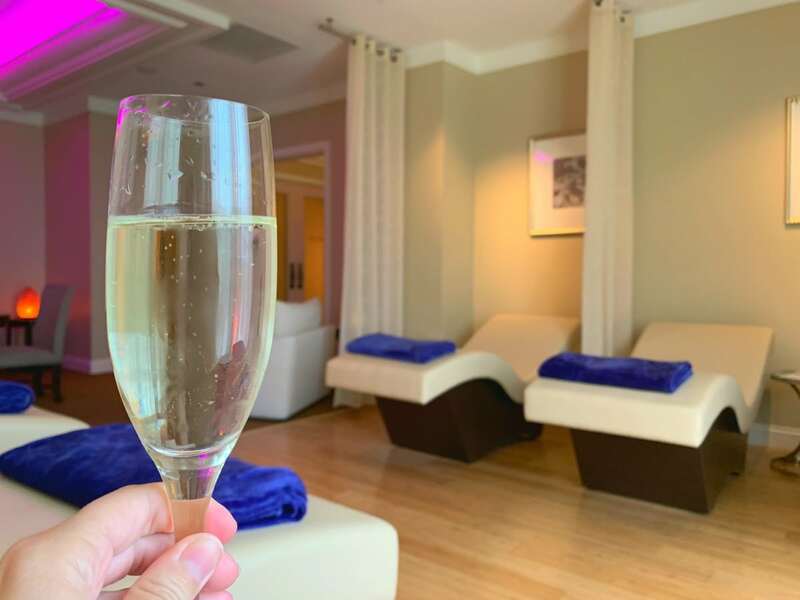 The Waldorf Astoria Orlando (it’s located at Walt Disney World Resort in-between Disney Springs and Disney’s Hollywood Studios) is the first full-service resort spa in Florida to have its own Himalayan Salt Room for halotherapy (and it’s one of only seven in the U.S.). The Orlando salt room is an intimate room at the spa that holds a maximum of two people. 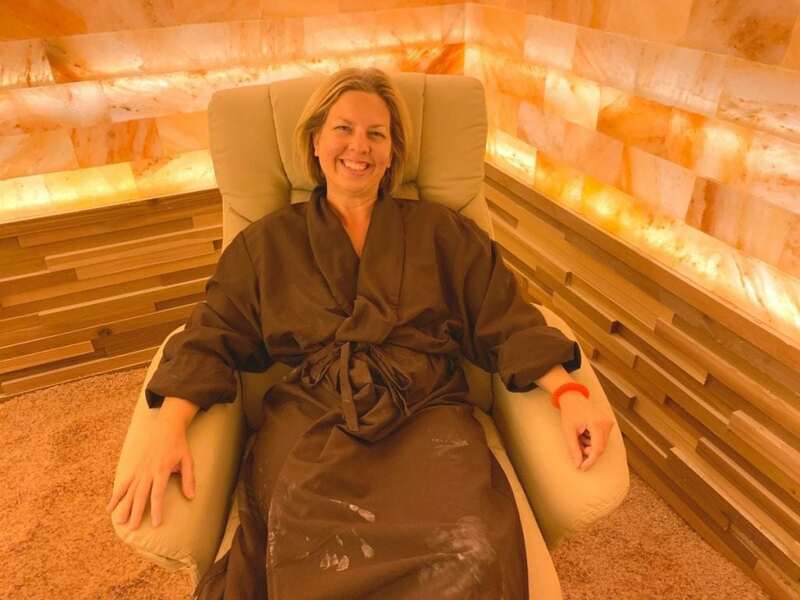 If you book it for just one person, you are guaranteed to be alone in the salt room for your halotherapy session (another person won’t be added to the room at the same time). I was awed by the beauty of the salt room. Seriously. The entire room took on a beautiful soft pink glow from the walls made with blocks of Himalayan salt bricks mined from Pakistan. The floor was covered with granules of salt, similar to rock salt. Everywhere you looked, there was a fine layer of dust from the salt spray that is used during a halotherapy session. There are two lounge chairs in the salt room. The lights can be dimmed and music can be played, if you would like. The door has a large glass window so you don’t have to feel like you claustrophobic. 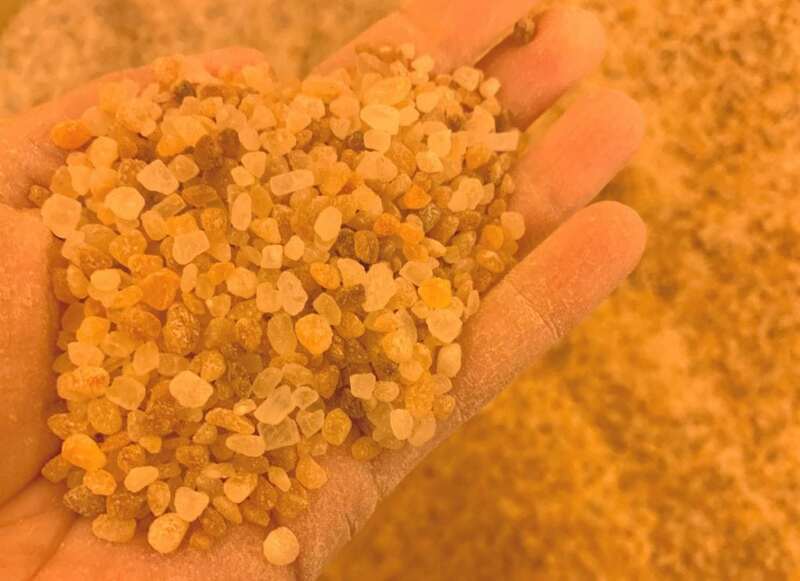 I’d suggest a Himalayan Salt Package, which combines a Himalayan Salt Stone Massage with a Himalayan Salt Therapy session. Does Salt Therapy in a Salt Room Work? I enjoyed a Himalayan salt stone massage, as well as a 30 minute salt therapy session in the salt room. The massage was great. 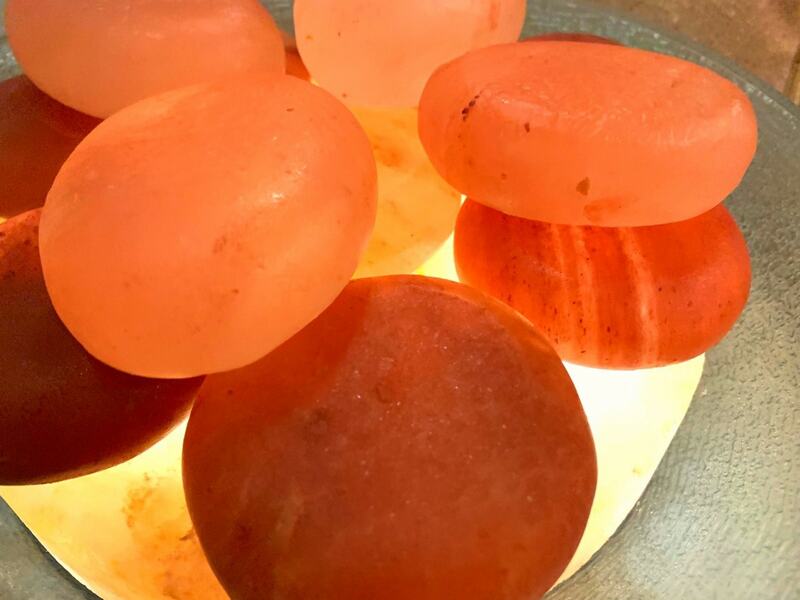 I’ve never had a hot rocks massage before, and the sensation of a hot piece of Himalayan salt being applied to your skin in massaging movements is different at first, but instantly becomes relaxing. However, the highlight of my visit was definitely the salt room. Stepping into the salt room, I loved the way that it looked: calm, serene and soothing. As soon as I was settled and the halo generator was turned on to add fine salt particles to the air, I instantly started feeling better. In fact, I was coughing and my chest congestion was clearing about 5-10 minutes into the salt therapy session. I was told before the salt therapy session started that the salt releases negative ions, which can improve your mood. Again, it’s similar to walking on a beach and you feel a little bit better all around. When I left the salt therapy room, I actually DID feel better. My chest congestion loosened, and I actually felt more relaxed and happier. I followed the salt room with a nice long stay in the Tranquility Lounge. I was given a glass of champagne afterwards, so I laid down on the zero gravity beds, closed my eyes and simply relaxed. There were color changing lights in the Tranquility Lounge, along with salt lamps and a light snack. No one else was there, and it was such a relaxing moment. Then I headed to the jacuzzi tub and hot sauna. I thought I’d help really loosen up the chest congestion with dry hot steam and then pounding jets on my lungs in the pool. I really was feeling so much better. And when another guest came in to the Wet Lounge area, we started talking. She was there for the same reason: weeks of coughing and no medicine was helping her with her chest congestion. She was thrilled to hear that the salt therapy room worked! 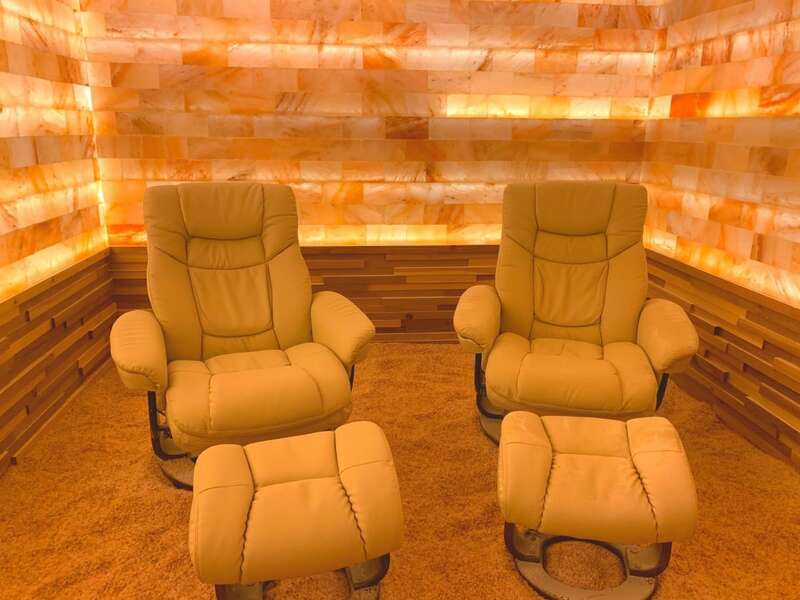 Of course, you don’t have to be battling a health problem to enjoy the Himalayan Salt Therapy room and experience it’s positive effects. It’s a great mini-indulgence that has positive benefits in so many ways. Interested in other spa services? Check out our review of a Hydrafacial treatment (at a different south Florida resort).